We are living in a digital age. With the affordable internet, finding information online is no more difficult. From trivia to complex mathematical equations, everything is on our fingertips. Type a few keywords and you’ll have a pool of knowledge in front of you. That’s the power of internet search in the present times. The immense popularity of search engines is a testimony of that. Google, Bing, Ask etc. have disrupted our lives and businesses in the true sense. These workhorses of the web, have shifted the paradigm to informational advancement.To put it in other words, the importance of search engines is undeniable. To an individual or a business, they can mean great success if used in a proper way. New products, online ads, social media campaigns etc. search engines can handle everything. But, you can not say the same for enterprise search implementation. Staffing is a major issue that pegs enterprise search implementation. In most of the organizations, it has no real owner. A few staffs keep the search software running. But, what’s missing is a proper index update. There is no confirmation whether all contents are indexed or not. This makes enterprise search more of a liability rather than an asset. The problem with enterprise search is that the users look for a specific search result. The related results are of no use to them. They have to use more advanced filters, such as time, date, document format etc. This all adds up to the complexity of enterprise search solutions. The page rank algorithm rank websites on the basis of more than 200 factors. This helps Google to assess the relevance of the information on a frequent basis. But, there is no option of ranking in enterprise search technology solutions. The lack of linking among documents add up to the woes. Also, far fewer people search for enterprise content online. This makes it difficult for the engine to favor certain results over others. In an enterprise, program, systems, documents etc. are password protected. The employees must have user rights to access them. These restrictions impact search results and performance. Contrary to this, Google doesn’t have to deal with such security levels. Any information available in the public domain is accessible to all. This restricted atmosphere makes enterprise search lag behind the internet search. 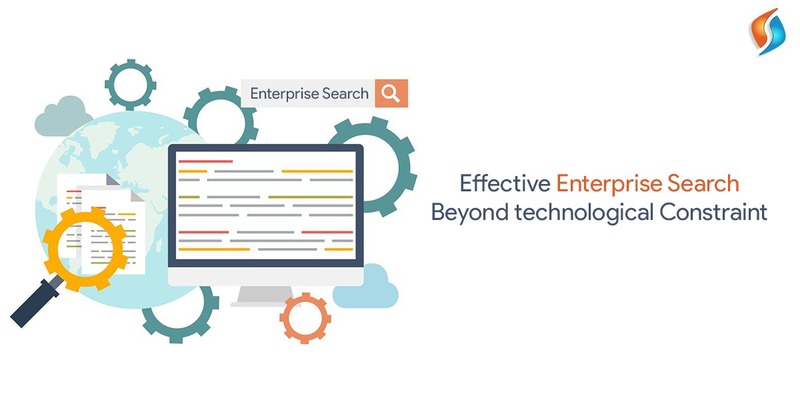 To summarize, the problems of enterprise search implementation is not technological in nature. The need of the time is to implement it in a proper way. If used in a judicious manner, it can do wonders to the corporate world. We at Signity Solutions have years of experience working on enterprise search solutions. We have a dedicated team of developers with us. So, if you also wish to incorporate enterprise search into your business, hire our outsourcing team. Feel free to reach us. We will revert at the earliest.